The Customize Windows > Computer and Internet > Hardware > How to Use Python on Arduino, Like to Blink LED? How to Use Python on Arduino, Like to Blink LED? We can directly use C++ on Arduino instead of using Arduino’s default way. Also, we can code with C on Arduino. As readers possibly know – Arduino does not have any special language. But, How to Use Python on Arduino, For Tasks Like to Blink LED?. We need not to compile the Python scripts unlike C++ but simply run the Python scripts from Terminal/iTerm2. That is not exactly great, but kind of Python with help of some computer. Which is great when Arduino is combined with Raspberry Pi and script needs changing faster. Download that “Firmata Test Program”. Run that program. Select port from dropdown where Arduino is, on MacBook Pro, it was /dev/cu.usbmodem1411 for me. For GNU/Linux, it will be like /dev/tty.usbmodem1411. For Windows, it will be like COM 3. Test by clicking Low beside Pin 13. The LED on Arduino board should blink. RX will “wink” for a while. That worked for me. At this moment I am not expert around running Python scripts on Arduino. But logically the above way should make other things working. This Article Has Been Shared 7332 Times! Articles Related to How to Use Python on Arduino, Like to Blink LED? Title: How to Use Python on Arduino, Like to Blink LED? 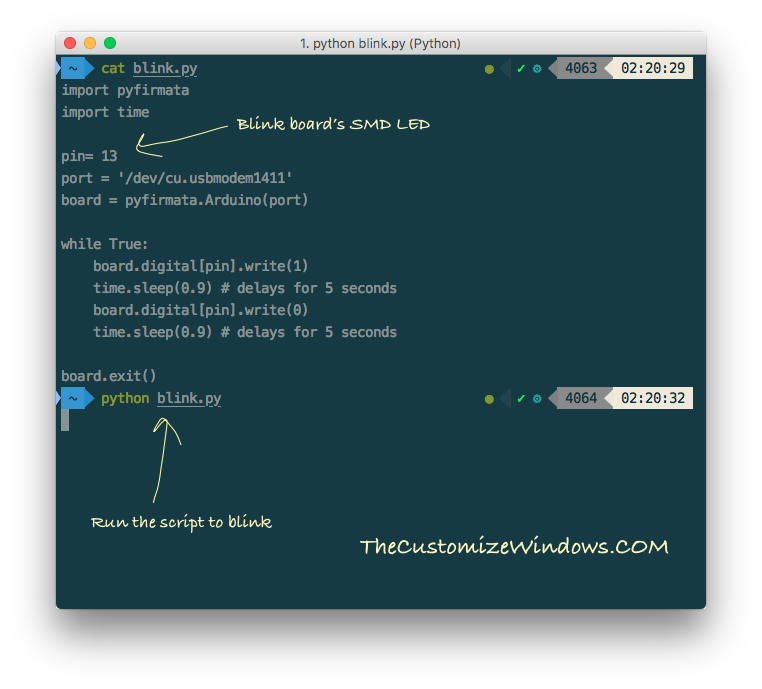 Cite this article as: Abhishek Ghosh, "How to Use Python on Arduino, Like to Blink LED?," in The Customize Windows, November 12, 2017, April 21, 2019, https://thecustomizewindows.com/2017/11/use-python-arduino-like-blink-led/.